If I wasn’t already an athiest, making Religieuse this week would have turned me into one. These little choux bun towers, named for the nuns they are supposed to resemble (you’d have to be on drugs to mistake mine for nuns), represent what I dislike about cooking. They are not very difficult to make, but they are really, really fiddly. And there are a few components to make, which generate a lot of washing up. As I may have mentioned before, I am ultimately a lazy cook. I am also impatient. And I am clumsy. This was never going to be a marriage made in heaven. Firstly, you need to make a choux pastry, which is notoriously difficult, but I have never had a problem making it for profiteroles. Well, they do say that pride comes before a fall, don’t they? I made my first set of choux, feeling extremely confident. Obviously I didn’t bother piping it out, as that was too much of a faff, and so spooned the mixture onto a baking tray – 8 mid-sized balls, 8 small balls. I then realised I had forgotten to turn on the oven to pre-heat and so switched it on quickly and put them into a cold oven. I am not sure if this caused the problem, or the fact that I had patted the balls quite flat, but they resolutely refused to rise. They were going to be very short and dumpy nuns. Whilst the choux was baking into flat little biscuits, I moved on to make the creme patissiere. This also has a reputation for being difficult, but I’ve never had an issue with it before. In fact, creme pat is much more stable than a normal custard (which I have split many times) due to the addition of flour and cornflour, which allows you to boil the mixture – unlike custard. I don’t understand the science behind it but it works, and the cornflour also thickens the creme pat, so you don’t need to cook it over a low heat for ages like normal custard. Luckily this time I made it without any problems. Then I made the chocolate ganache – again very simple: heat the cream and then add the milk chocolate to it to melt (I find dark chocolate too rich and prefer milk chocolate). Mix together and allow to cool to a spreadable consistency. Nothing hard there, but I do remember from a previous Mary Berry recipe for Yule Log that the ganache takes forever to cool enough to be spreadable, so I thought it was a good idea to make it early. I had spread the Christmas ganache onto my Yule Log and watched it dribble off the sides, taking half the cream from inside with it. I had to re-apply the ganache several times, making more and more of a mess each time. Luckily at the end you dust the cake with icing sugar – that hid the worst of my mess, and it still tasted nice. I remember watching the Bake Off and thinking the ganache was still too liquid when the contestants had to dunk their nuns, so I wanted mine to me thicker and easier to use. Then I took my choux buns out of the oven, and as they were so pathetically flat I decided I would have to make them again. They were so flat that there would be no space for the creme pat. 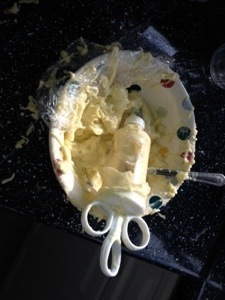 And, I must confess, I didn’t want to have a photo of a totally rubbish Religieuse on my blog. 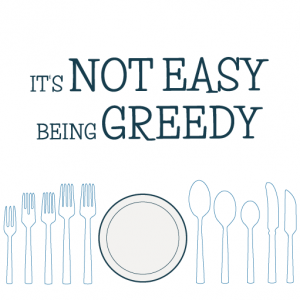 Vanity – another sin. This Godly task was definitely bringing out the worst in me. 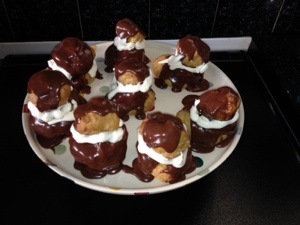 Before choux round 2 I checked my Saint Nigella recipe for profiteroles. In her recipe (from Domestic Goddess) she says to remove the butter, water and flour mixture from the heat as soon as it is combined, unlike Mary’s advice to keep it on the heat for 3-5 minutes (presumably to cook out the flour). So I went for Nigella’s approach and immediately removed the flour mixture from the heat before beating in the eggs, and this time the mixture felt much more like I was used to. It was a smoother, silkier, more spoonable consistency, and low and behold, the resulting choux buns rose beautifully. Nigella 1, Mary 0. So apart from having to waste time and ingredients to attempt the choux buns for a second time, so far so good. Nothing too challenging, nothing to fiddly. But it’s the assembly of these bloody nuns which I found so irritating. 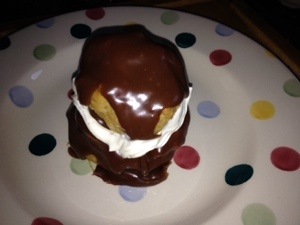 Normally when I make profiteroles, I just tear a hole into the choux bun and spoon some chantilly cream inside. Okay, it’s a bit messy, but it’s quick and easy, and once the profiterole is covered with chocolate sauce no one notices anyway. And they taste AMAZING. The Religieuse however need to have creme pat piped into them. Luckily I found an icing syringe in one of my drawers (I can’t remember when or where I bought it – my drawers are packed full of cookery bits and bobs like that which I buy when I see them, not imagining when I will ever need to use them but wanting them anyway). I thought that would make filling the buns more easy than using a piping bag, but it was a total nightmare to fill them. I probably own the cheapest, most useless icing syringe in existence – it was fiddly to screw shut after filling with creme pat, the end would pop off every time I squeezed down on the syringe to pipe the creme pat, and so it was a messy, time consuming and boring job. Additionally, it is physically IMPOSSIBLE for me to get creamy custard on my fingers and not lick it. And I was getting a lot of creme pat on my fingers. As well as feeling sick with boredom by the time I finished filling the buns, I was also sick from eating too much creme pat. And then I moved onto covering the buns in ganache. Still the ganache was quite liquid and so it dribbled off the sides of the buns and wasn’t really sticky enough to keep the nun’s heads balanced on top of their bodies. More annoyance. More reason to lick fingers. My tummy was getting distended from eating all the scraps. And then finally, after leaving the nuns to chill in the fridge and hopefully stick together, piping the cream onto the nuns to make a “collar”. I am pretty rubbish at piping anyway, as it’s too fiddly for me to bother with practicing much. My lack of experience in piping certainly shows on my little nuns – they are quite untidy. But finally finished at least. So here’s how I made them. And for the official recipe, you can view it on the BBC website here. Make the choux by heating the water and butter in a pan until the butter is melted and the water boils. Then take the pan off the heat and add the flour and mix with a wooden spoon until combined and coming away from the side of the pan. Add the eggs a little at a time until combined with the flour mixture. The end result should be a silky, spoonable mixture, which you need to dollop onto a baking tray lined with greaseproof paper in 16 balls – 8 medium sized (small ping pong balls), 8 small (grape sized). Put in a pre-heated oven (220 degrees) for 10 minutes and then turn the temperature down to 190 degrees for another 10 minutes, then take the buns out of the oven and pierce each one underneath with a knife to allow the steam to escape. Put them back in the oven for a further 5 minutes, and then transfer onto a wire rack to cool. While the choux buns are cooking you can make the creme pat by heating the milk and vanilla bean paste until it boils. While the milk is heating, whisk the egg yolks with the sugar, flour and cornflour. Then pour the boiling milk onto the egg mixture and keep whisking. Transfer back into the saucepan (this was where I realised that my saucepan was too small – whoops) and bring the mixture back to the boil, whisking continuously. The mixture will immediately thicken. Then turn the heat down and continue whisking the mixture while it heats on a low temperature. Then transfer to a bowl and allow to cool. Put clingfilm over the top of the creme pat to stop a skin forming. 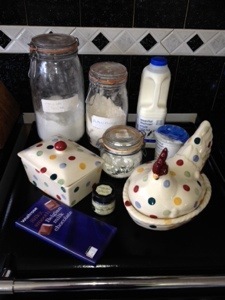 You should still have time to make the ganache while the buns are cooking – bring the cream to the boil, remove from the heat and put the chocolate chunks into the cream. Leave for a couple of minutes until the chocolate melts and then mix until combined and silky smooth. Allow to cool for a couple of hours at least. Whip the cream so that’s ready to pipe as well. And then if, like me, you muck up the first choux buns, make round 2. Assemble by piping the creme pat into the choux buns. Then spread some ganache onto each large bun and put them on a plate. Balance a smaller filled bun onto the large one (it will hopefully stick to the ganache) and spoon some more ganache onto the top bun. Put in the fridge to cool and then pipe the cream around the neck of the nun (where the two buns meet) to make the collar. 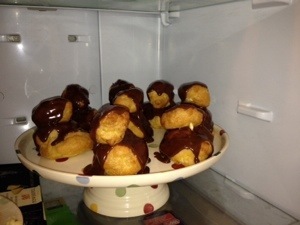 Eat, vowing to make profiteroles next time. 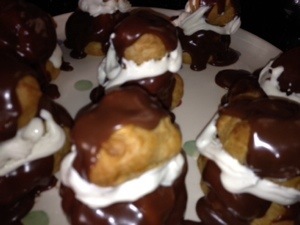 The Religieuse are nice, but I definitely prefer profiteroles filled with cream and smothered with chocolate sauce. I won’t be making Religieuse again. If you put a blob of cream on the top they could be monks!! Really impressive! I also have the chance to test these wonderful chocolate religieuse and it was really delicious. Welldone! 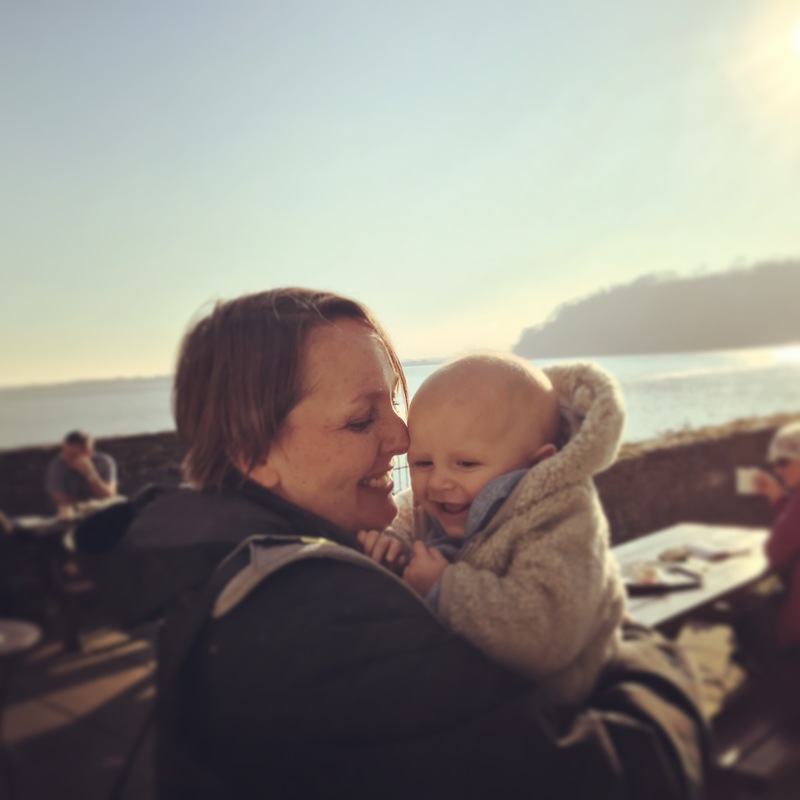 Thanks Sophie – that’s praise indeed from a French person!